February 2016 Aries Horoscope predicts that this month requires you to pay attention to professional matters. Home and family issues can wait for the time being. About 70 per cent of the planets are in the Eastern half of the birth chart in February 2016. This makes the Ram’s personal ambitions and creativity more important than social grace or flexibility to attain their goals in life. However you do require the help of others in the execution of the large business ventures that you are planning. Till 19th February, emphasis will be on forming new social contacts and on enlarging your circle of influence. After that spirituality and humanitarian activities will be your focus. Profession will be significant till the second week of the month forecasts the 2016 February monthly Aries forecasts. Planet Saturn is not favorable and caution is to be exercised on career issues during the month. Influence of planet Mars is seen in financial activities during 2016 February for the Aries zodiac sign. You will be energetic and adventurous while creating wealth. There will be a personal commitment in monetary activities. All the challenges you face on the way will be resolved successfully. The 2016 astrology predictions also foretell that family members and influential people will assist you in getting new financial projects. Your financial intelligence will be powerful and it will guide you to invest money in realty and stock market. You will get handsome returns on your investments. Month end eclipse will pose some monetary disturbances which will be temporary. Aspect of Venus is auspicious and love will be predominant during the month. Eclipse in February 2016 end may induce problems in the existing relationships for a couple of days. Single Arians will find love in the office with colleagues. Your spouse or love partner will be extremely affectionate with you and romance will be booming. The 2016 February Aries monthly forecasts also suggest that sexual intimacy between couples will reach an all time high. News about pregnancy is on the cards for people planning for a child. You will devote more time in dressing up in fashionable clothing and accessories to please your lover. Health will need some attention during the February 2016 for the Rams and can be further improved by working on your body. Problems related to joint pains might plague you. 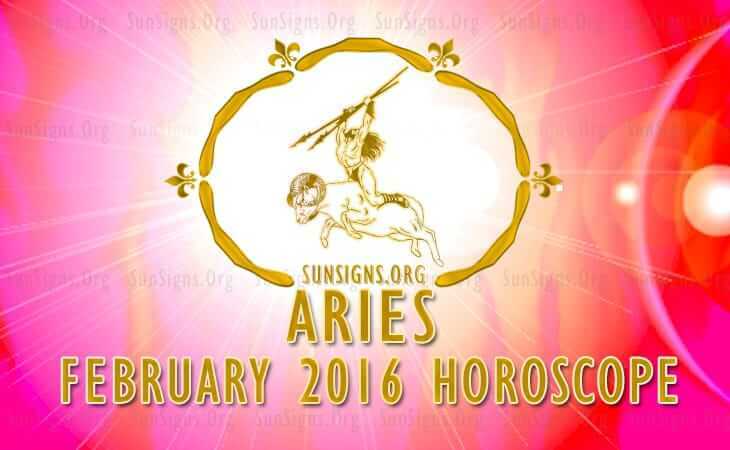 To conclude, the Aries February 2016 Horoscope foretells of a month of caution when it comes to career and health. You can expect some passionate moments in your relationships.